Fantastic family home with legal 1 bedroom suite on spacious lot in Departure Bay. Well maintained home boasting loads of windows, large rooms & distant ocean views. Open concept living/dining room with modern laminate flooring & attractive tile surround wood fireplace feature wall. The bright kitchen has an eating nook & stainless appliances with patio door leading out to the wide front deck with vista view of Departure Bay. 3 bedrooms on the main, all with big closets, plus a skylight in the full main bath & a tub/shower combo in the ensuite. Spacious den off the entry hosts a gas fireplace & lots of windows for natural light. In the large fully fenced backyard you'll find many prosperous fruit trees including apple, pear, cherry, plum & fig! Currently backing onto private green space. RV parking & double car garage. 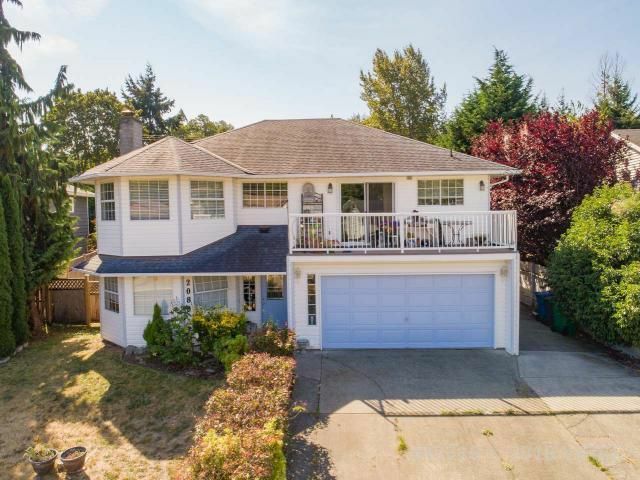 Walking distance to Departure Bay beach, schools, bus stop & park across street. Suite has separate hydro meter, laundry & private back entrance. All msmts approx. For floorplans & video tour visit our website at www.TeamInvestWest.com or contact Mandy Colford with Re/Max for a private showing at 250-668-3633.